Handy online conversions and charts for all your planting needs. A little effort around Thanksgiving can result in huge indoor flowers for Christmas. Pollinators, including bees, butterflies, beetles, birds and bats, play an essential role in maintaining healthy ecosystems. They provide the service of pollinating our crops and plants, which in turn increases crop yield and biodiversity in the natural environment! Pollinators are responsible for pollinating over 30% of the foods we eat! Pollinators, such as bees and butterflies, require a constant source of food from when they emerge in the Spring, right through to the Fall. Be sure to have a continuing sequence of flowers in bloom to provide pollen throughout the growing season. Native plants have co-evolved with pollinator species, and are well adapted to the climate, soil, and growing season. It is okay to plant non-native plants as long as they are not invasive, and are planted according to the label. Pollinators can navigate single bloom flowers much more easily because their nectaries are exposed, allowing easy collection of nectar and pollen. Petals of double bloom varieties often block the flower's' nectary, making it difficult to navigate. Butterflies require specific host plants to lay their eggs, so that their offspring (caterpillars) can feed on them once they emerge. For example, monarch butterflies require milkweed to feed on in the early stages, so that's where adult monarch's lay their eggs. Once the caterpillars become butterflies, they feed on all nectar and pollen sources. Try to group plant species together instead of single plants throughout your garden. For example, planting a large patch of echinacea. Mass planting helps pollinators spot resources more easily, pollinate more efficiently, and spend less energy collecting pollen and nectar. Bees tend to collect pollen from one type of plant at a time. Proper watering helps maintain healthy plants, which increases nectar and pollen sources for pollinators. Try to use natural fertilizers, such as compost, to help add nutrients to the soil. If necessary, use a slow-release fertilizer. Pollina· tors are very sensitive to chemicals, so try to remove weeds by hand. Regular trimming and deadheading plants will encourage new growth for more blooms, and a longer flowering season. The more pollen and nectar available, the better! Perfectly manicured lawns and gardens do not have as much of a benefit to pollinators. The bees will thank you for leaving those pesky dandelions on your lawn, as they provide essential nutrients in the early spring. Fallen trees can provide crucial habitat for the many species of cavity nesting bees when left in your garden. Excessive raking or tilling should be avoided to prevent destroying ground-nesting pollinator's nests. There are many native bee species that build their nests in the ground, by tunneling into the soil. You can provide habitat for them by leaving areas of bare soil throughout your garden, hidden behind your plants. Nesting boxes can be purchased at many garden centres. There are also many different ways you can build nest boxes for native, cavity-nesting bees. They love to build nests in hollow reeds or existing tunnels in untreated wood. Pollinators also require a source of fresh water. You can provide a safe water source in your garden by fi lling a shallow dish with water and marbles. Bees and other pollinators can land on the marbles and collect water without the risk of drowning. It is important to change the water often and keep it full, as bees and other insects will return to the source. By incorporating these ideas into your garden, you can provide crucial habitat and nutrition for many pollinator species that are currently at risk. Many pollinator species populations are at risk due to a combination of many different factors, including: climate change, habitat loss, and pesticide exposure. The decline of pollinator species could ultimately lead to a parallel decline of plant species, threatening biodiversity and food security. Habitat destruction and fragmentation is having a significant effect on pollinating species. Providing foraging and nesting opportunities in your own garden can reduce this stress significantly. Pollinators locate food sources by sight and scent. It is important to keep in mind that not all pollinators see colour the same as we do, like honey bees for example. We base our vision off of three colours of light: blue, green and red. Whereas honey bees base their vision off of blue, green and ultraviolet light. This combination makes it very difficult for a honey bee to decipher a red flower from a green background. You can help out the honey bees by choosing flowers that have white, yellow, blue or purple flowers. This will help them spot resources in your garden more easily! Pollinators will also go crazy for aromatic flowers, such as lavender! 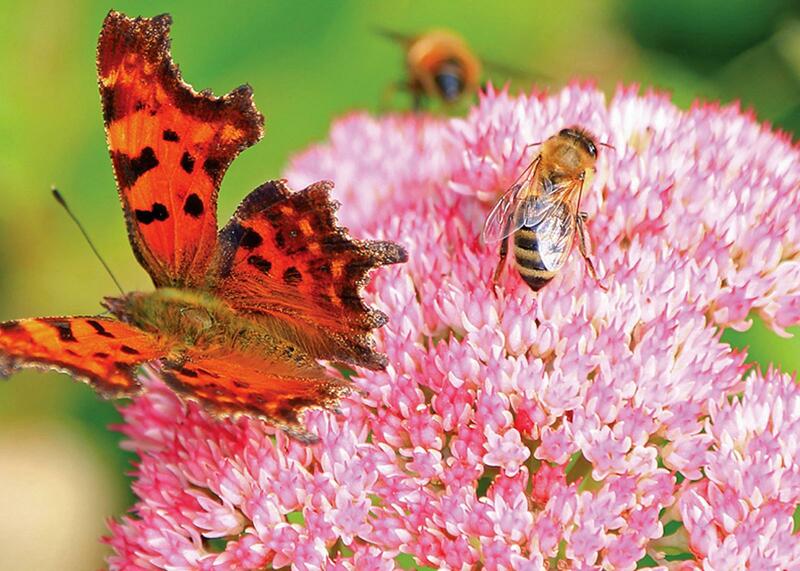 Make your garden more pollinator friendly with these tips from Landscape Ontario.